Careers360 which bought NoPaperForms last year is now demerging this as separate company. NoPaperForms is a cloud based enrollment management platform helping education entities to move online to manage end to end enrollment. It is also working on advanced machine learning enabled smart data analytics modules which will help institutions to slice and dice data, benchmark performance and measure ROI on real time basis. The new company, which was initially a division of Careers360 got registered as NoPaperForms Solutions Pvt. Ltd on 8th Feb 2017. Careers360’s promoter Director and Chief Strategy Officer Naveen Goyal, is moving out and buying NoPaperForms. Goyal during his five year plus tenure strategized and created the digital business division of Careers360. Sources say the value of the deal is in the region $3 Mn in equity and cash. The company is now moving out with team size of 42 members and 80 clients. It makes more strategic sense for the two businesses to be separate entities as there is fundamental conflict of interest in the nature of both companies , said Naveen Goyal, CEO of NoPaperForms. Goyal added that currently institutes are using traditional style of admission process with no clear understanding of marketing ROI. With the rise in in competition and students moving online it's imperative for institutions to have a robust platform to simplify admission process from inquiries to enrollment. 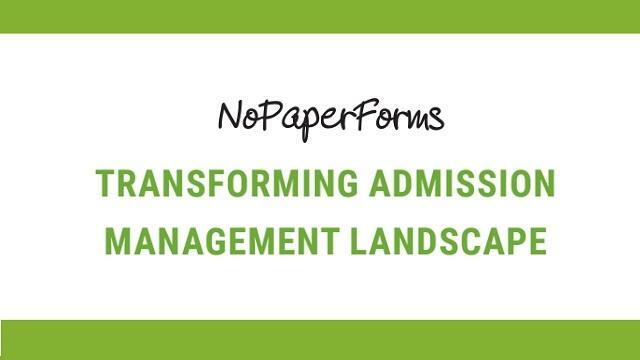 NoPaperForms benchmarks itself against international players like Hobsons' Radius, Ellucian etc. and plans to grow to be a national leader within a short span of time concluded Goyal.